Legal, regulatory, and ethical perspectives on balancing social benefit and human autonomy in research using human biospecimens. Advances in medicine often depend on the effective collection, storage, research use, and sharing of human biological specimens and associated data. But what about the sources of such specimens? When a blood specimen is drawn from a vein in your arm, is that specimen still you? Is it your property, intellectual or otherwise? Should you be allowed not only to consent to its use in research but also to specify under what circumstances it may be used? These and other questions are at the center of a vigorous debate over the use of human biospecimens in research. 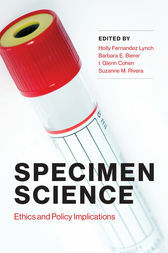 In this book, experts offer legal, regulatory, and ethical perspectives on balancing social benefit and human autonomy in biospecimen research. After discussing the background to current debates as well as several influential cases, including that of Henrietta Lacks, the contributors consider the rights, obligations, risks, and privacy of the specimen source; different types of informed consent under consideration (broad, blanket, and specific); implications for special patient and researcher communities; and the governance of biospecimen repositories and the responsibilities of investigators.